David and Amy Fox find themselves stranded in the middle of nowhere when their car breaks down. Luckily, they come across a motel with a TV to entertain them during their overnight stay. 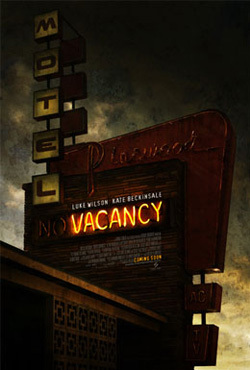 However, there's something very strange and familiar about the Grade-Z slasher movies that the motel broadcasts for its guests' enjoyment. They all appear to be filmed in the very same room they occupy! Realizing that they are trapped in their room with hidden cameras now aimed at them filming their every move, David and Amy desperately find a means of escape through locked doors, crawlspaces and underground tunnels before they too become the newest stars of the mystery filmmaker's next cult classic!